The Farr Out Family: Wendy has a new face! Wendy has a new face! So, Jordan decided he wanted to do a little advertising... 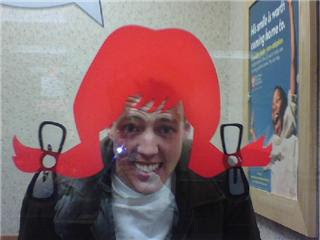 He's thinking of quitting his accounting job to become the "new Wendy". He looks great with bright red hair, it matches his eyes. This is what our kids will look like too... my hair with his face! YEAH!